Welcome to Turbulence Training Day 3. Home fitness workouts that'll burn fat and sculpt your body in 4 weeks. 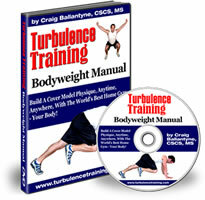 This is day 3 of Turbulence Training's Buff Dudes and Hot Chicks fat burning workout. "Hello hello! Welcome to day 3 of Craig Ballantyne's Buff Dudes and Hot Chicks Turbulence Training workout, and today was upper body; which was arms, chest, shoulders and upper back. So I was really able to attack this workout because I was quite confident that I could do it really well. The supersets are listed below if you're on Better4Fitness.com, if not then WHY not! Go there now and you'll be able to see all the exercises and what order they came in for today's workout. I completed all the sets today, which is a completely different story to Monday (day 1), with the lower body stuff. Upper body is a completely different story for me. So it was a really good day. The only thing I'd say is that with the pull ups, I don't have access to any pull up bar at the moment. So I improvised and did dumbbell pull overs instead (on the exercise ball). And a couple of the other exercises, namely the supported row and the incline press, I had to improvise with them as well because I don't have a weights bench (or any sort of bench really). So I just used the exercise ball. And you'll be able to see following this, exactly how I did it. Granted it is in super-speed, but you'll still be able to make it out. So here it is coming up now, hope you enjoy it and I'll see you tomorrow."